Bread sauce can be traced back to medieval times in Britain and can be served either warm or cold. Traditionally made with bread crumbs or stale bread and spices, I have opted instead for fresh bread. Serve with turkey or chicken. I did as little as possible in December other than a lot of reading. And a fair bit of TV watching. Being in such a relaxed state of mind was great. The ideas just started flowing. I placed a notepad next to where I sit and wrote down a whole host of things. Some of them are recipes I would like to work on during the year. And some were recipes I tackled while on leave. I also came up with some great ideas for my kitchen. And thought of a hundred and one tasks for Dave to complete. It has been quite some time since I felt so inspired. And to make sure I did not kill the inspiration I spent very little time actually cooking. I decided to learn how to use the ‘end cook’ feature on my oven. This allows you to select when you would like the food to be done. For my experiment I chose to roast a chicken. I prepared everything, and placed the pan in the oven at 17h00 with the aim to eat at 19h30. I set the temperature (180° Celsius), the cooking time (90 minutes) and the end time. Then we went out for drinks. We came home to the most amazing scent of roasted chicken. 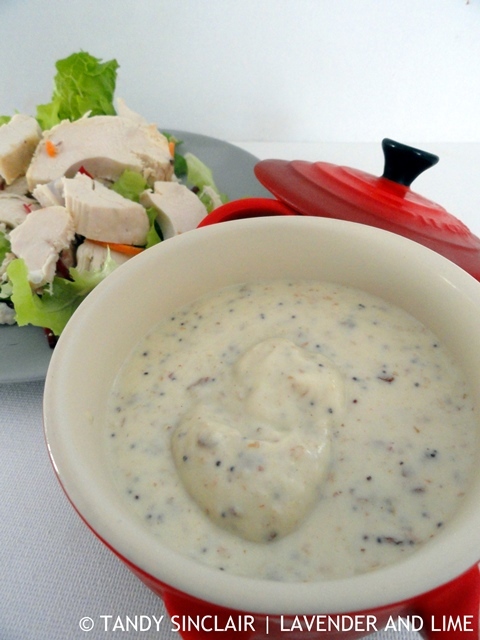 I had made the bread sauce during the day to serve with the chicken. And loaded the roasting pan with cauliflower, carrots and leeks. The combination was a great meal. And I ticked two things off my list. The next day I served leftover cold chicken with a simple salad. I used the bread sauce again as a salad dressing. The ‘spots’ you can see are from using the Cape Seed Loaf. Funny you should mention the ‘end cook’ function Tandy. We went to the theatre the other day and it may a ‘late matinee’ at 5pm. I put a roast chook in the soaked Romertopf and set it to start and finish whilst we were out. We came back to a delicious roast that just needed some green beans. Perfect for the winter months too when a meat cut can sit in the cold oven for most of the day before it starts cooking in the early afternoon. It is a great feature! Thank you for the idea ! Never made anything like this sauce but the ingredients promise a lot. It’s still so cold out here and this is so comforting ! Have a pleasant day ! I have never had bread sauce before, this is something I need to try soon. I wish my oven had a ‘end cook’ feature! And I have never heard of bread sauce, interesting! I am enjoying the end feature a lot! Delicious! 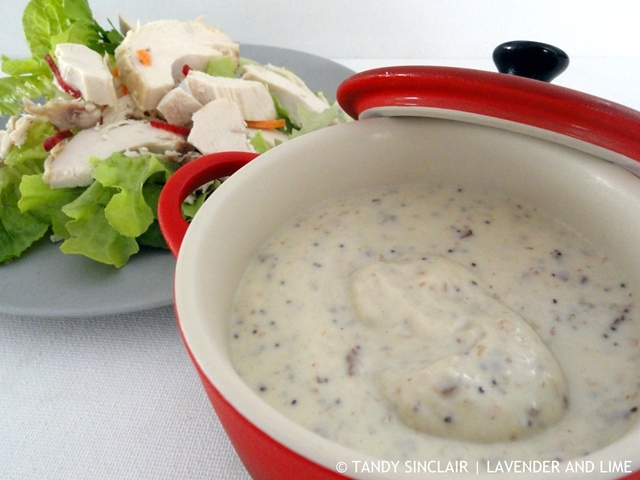 My nan used to make the best bread sauce – this recipe brings back such delicious memories! Hi Tandy, never heard of bread sauce before, looks delicious. A deliciously simple sauce, one of my favourites. Your bread sauce sounds delicious but my family, having eaten my traditional English bread sauce for the last fifty six years, would have a heart attack if I presented them with your version! The traditional one is made with an onion, studded with cloves, covered with milk and brought just to the boil, then left to steep for at least twenty minutes. The fresh breadcrumbs are added after this steeping and the mixture brought to just below a boil. When ready to serve, the clove studded onion is removed and a knob of butter added to the mixture which is given a good stir. I have even managed to convert my Australian daughters-in-law to bread sauce which they now make for my sons! Thanks you for all your wonderful recipes which I enjoy receiving and endeavour to cook. A simple recipe, Tandy. Sounds good… I must admit, with apologies, the thought of bread sauce has never quite appealed to me.